Located on the Pasubio massif in Veneto, Italy is a series of roads and ultimately 52 tunnels carved into Monte Pasubio. These series of tunnels were constructed in 1917 during World War I. What is impressive is that given the altitude, conditions and technology at the time these maze of tunnels took less than one year to complete. 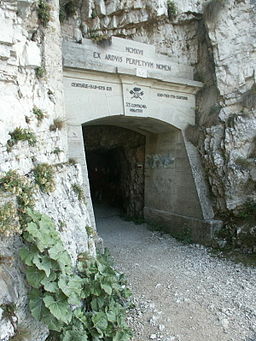 The Italian army in need of protection from the Austro-Hungarian artillery strikes came up with the plan to carve tunnels through the mountain to ensure that supplies and men could safely navigate through the mountains out of range from any attacks. Under the leadership of Lieutenant Joseph Zappa, the Italian army started this daunting task. With no real plans on how to undertake this mission, they were only instructed that each tunnel needed to be at a minimum width of 2.20 meters (7.2 feet). Enough to allow two mules carrying supplies to travel through. The first tunnel was built at the Bocchetta Campiglia, 1,216 meters/3,990 feet above sea level and it ended at the Porte del Pasubio, 1,934 meters/6,345 feet above sea level. Each tunnel had its own difficulties based on the elevation and length the tunnel needed to be. Each tunnel is named and numbered ranging from 8 meters (tunnel 22 named Breganze) to 318 meters (tunnel 19 named Re after Victor Emmanuel III of Italy) in length. The most intriguing and fascinating tunnel is no. 20 named after Gen. Cadorna. The tunnel was carved out of a rock tower and it gives the appearance of a corkscrew to accommodate the difference in elevation. After the war was over the tunnel system was forgotten and eventually fell into ruin. They were later restored and today they have become a popular haven for hikers. Not only do you get to enjoy the picturesque views as you make your way through the tunnels you also get a sense of the conditions that the Italian army was facing. If you are an avid hiker or a military history buff then you may just want to head to the Veneto region and make the journey through each tunnel and see for yourself this extraordinary engineering achievement. If you do plan to walk through the tunnels keep in mind that the trail can get icy and slippery. The temperature will get colder the higher you travel up the mountain so make sure you wear appropriate clothing. To navigate through the tunnels, which are not lit, bring a flashlight.